Flux healed ruby has been heat treated with flux material that heals natural fissures within the stone. The process leaves flux residues, but only minor when compared to infilling or lead glass treatments. During heat enhancement, fluxes may be used to heal natural fissures. The process leaves glass residues, but minor when compared to infilling or lead glass treatments. The filling of surface-breaking cavities or fissures with colorless glass or fluxes during the heat treatment process. Improves clarity and color, and it may possibly add weight. Lead is not present in these materials. Surface reaching fractures and cavities of the stone are filled. One might be able to see flash colors in infilled stones. 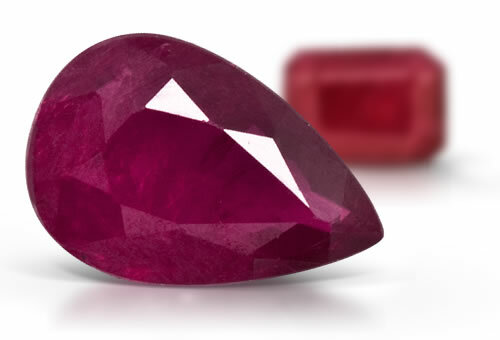 There is a difference in luster between ruby and glass areas of the stone. Stones will show evidence of heat treatment with damaged mineral inclusions. Sometimes stones have silk, rutile, boehmite, apatite, calcite or zircon crystals. Fingerprint and negative crystal inclusions. Hexagonal growth and color zoning. Heat treated stones will have fracture halos, discoid fractures or snowballs around crystal inclusions Silk will be broken and might show sintered areas especially around the girdle.